This article is about the star in Cygnus. For other uses, see Deneb (disambiguation). Deneb (/ˈdɛnɛb/), also designated α Cygni (Latinised to Alpha Cygni, abbreviated Alpha Cyg, α Cyg), is the brightest star in the constellation of Cygnus, the swan. 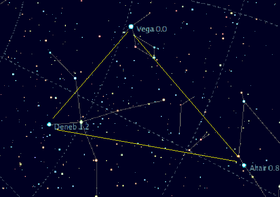 Deneb is one of the vertices of the asterism known as the Summer Triangle and the "head" of the Northern Cross. It is the 19th brightest star in the night sky, with an average apparent magnitude of 1.25. A blue-white supergiant, Deneb is one of the most luminous of the known stars. However, its distance (and hence luminosity) is difficult to estimate; its luminosity is somewhere between 55,000 and 196,000 times that of the Sun, rivalling Rigel as the most inherently luminous first magnitude star. α Cygni (Latinised to Alpha Cygni) is the star's designation given by Johann Bayer in 1603. The traditional name Deneb is derived from the Arabic word for "tail", from the phrase ذنب الدجاجة Dhanab al-Dajājah, or "tail of the hen". In July 2016, the Working Group on Star Names of the International Astronomical Union recognised the name Deneb for this star, and this name is entered in the their Catalog of Star Names. The 19th brightest star in the night sky, Deneb culminates each year on 23rd October at 6pm and 7th September at 9pm, corresponding to summer evenings in the northern hemisphere. It never dips below the horizon at or above 45° north latitude, just grazing the northern horizon at its lowest point at such locations as Minneapolis, Montréal and Turin. In the southern hemisphere, Deneb is not visible south of 45° parallel south, so it just barely rises above the horizon in South Africa, southern Australia, and northern New Zealand during the southern winter. Deneb is located at the tip of the Northern Cross asterism made up of the brightest stars in Cygnus, the others being β Cygni (Albireo), γ Cygni, δ Cygni, and ε Cygni. It also lies at one vertex of the prominent and widely spaced asterism called the Summer Triangle, shared with the first-magnitude stars Vega in the constellation Lyra and Altair in Aquila. This outline of stars is the approximate shape of a right triangle, with Deneb located at one of the acute angles. Due to the Earth's axial precession, Deneb will be an approximate pole star (7° off of the north celestial pole) at around 9800 AD. Deneb's adopted distance from the Earth is around 802 parsecs (2,620 ly). This is derived by a variety of different methods, including spectral luminosity classes, atmospheric modelling, stellar evolution models, assumed membership of the Cygnus OB7 association, and direct measurement of angular diameter, but these methods give different distances and all have significant margins of error. The original derivation of a parallax using measurements from the astrometric satellite Hipparcos gave an uncertain result of 1.01 ± 0.57 mas that was consistent with this distance. However, a more recent re-analysis gives the much larger parallax whose distance is barely half the current accepted value. One 2008 calculation using the Hipparcos data puts the most likely distance at 475 parsecs (1,550 ly), with an uncertainty of around 15%. The controversy over whether the direct Hipparcos measurements can be ignored in favour of a wide range of indirect stellar models and interstellar distance scales is similar to the better known situation with the Pleiades. Deneb's absolute magnitude is currently estimated as −8.4, placing it among the most luminous stars known, with an estimated luminosity nearly 200,000 times that of the Sun. This is towards the upper end of various published values over the last few decades. Deneb is the most luminous first magnitude star, that is, stars with apparent magnitude brighter than 1.5. Deneb is also the most distant of the 30 brightest stars by a factor of almost 2. Based on its temperature and luminosity, and also on direct measurements of its tiny angular diameter (a mere 0.002-second of arc), Deneb appears to have a diameter of about over 200 times that of the Sun; if placed at the center of the Solar System, Deneb would extend out to the orbit of the Earth. It is one of the largest white 'A' spectral type stars known. Deneb is a bluish-white star of spectral type A2Ia, with a surface temperature of 8,500 kelvin. Since 1943, its spectrum has served as one of the stable references by which other stars are classified. Its mass is estimated at 19 M☉. Stellar winds causes matter to be lost at an average rate of 8±3×10−7 M☉ per year, one hundred thousand times the rate from the Sun or equivalent to about one Earth mass per 500 years. Deneb spent much of its early life as a 23 M☉ O-type main-sequence star but it has now exhausted the hydrogen in its core and begun to cool and expand. Stars in the mass range of Deneb eventually expand to become the most luminous red supergiants, and within a few million years their cores will collapse producing a supernova explosion. It is now known that red supergiants up to a certain mass explode as the commonly seen type II-P supernovae, but more massive ones lose their outer layers to become hotter again. Depending on their initial masses and the rate of mass loss, they may explode as yellow hypergiants or luminous blue variables, or they may become Wolf-Rayet stars before exploding in a type Ib or Ic supernova. Identifying whether Deneb is currently evolving towards a red supergiant or is currently evolving bluewards again would place valuable constraints on the classes of stars that explode as red supergiants and those that explode as hotter stars. Stars evolving red-wards for the first time are most likely fusing hydrogen in a shell around a helium core that has not yet grown hot enough to start fusion to carbon and oxygen. Convection has begun dredging up fusion products but these do not reach the surface. Post-red supergiant stars are expected to show those fusion products at the surface due to stronger convection during the red supergiant phase and due to loss of the obscuring outer layers of the star. Deneb is thought to be increasing its temperature after a period as a red supergiant, although current models do not exactly reproduce the surface elements showing in its spectrum. Deneb is the brightest example of the Alpha Cygni type (ACYG) variable stars, whose small irregular amplitudes and rapid pulsations can cause its magnitude to vary anywhere between 1.21 to 1.29. Its variability was discovered by Lee in 1910, but was not formally placed as a unique class of variable stars until the 1985 4th edition of the General Catalogue of Variable Stars. The cause of the pulsations of Alpha Cygni variable stars are not fully understood, but their irregular nature seems to be due to beating of multiple pulsation periods. Analysis of radial velocities determined 16 different harmonic pulsation modes with periods ranging between 6.9 to 100.8 days . A longer period of about 800 days probably also exists. Deneb is considered by astronomers to be prototype of ACYG variables. Deneb has been reported as a possible single line spectroscopic binary with a period of about 850 days, where the spectral lines from the star suggest cyclical radial velocity changes. Later investigations have found no evidence supporting the existence of a companion. Names similar to Deneb have been given to at least seven different stars, most notably Deneb Kaitos, the brightest star in the constellation of Cetus; Deneb Algedi, the brightest star in Capricornus; and Denebola, the second brightest star in Leo. All these stars are referring to the tail of the animals that their respective constellations represent. Denebadigege was used in the Alfonsine Tables, other variants include Deneb Adige, Denebedigege and Arided. This latter name was derived from Al Ridhādh, a name for the constellation. Johann Bayer called it Arrioph, derived from Aridf and Al Ridf, 'the hindmost' or Gallina. German poet and author Philippus Caesius termed it Os rosae, or Rosemund in German, or Uropygium – the parson's nose. The names Arided and Aridif have fallen out of use. In Chinese, 天津 (Tiān Jīn), meaning Celestial Ford, refers to an asterism consisting of Deneb, γ Cygni, δ Cygni, 30 Cygni, ν Cygni, τ Cygni, υ Cygni, ζ Cygni and ε Cygni. Consequently, the Chinese name for Deneb itself is 天津四 (Tiān Jīn sì, English: the Fourth Star of the Celestial Ford). In the Chinese love story of Qi Xi, Deneb marks the magpie bridge across the Milky Way, which allows the separated lovers Niu Lang (Altair) and Zhi Nü (Vega) to be reunited on one special night of the year in late summer. In other versions of the story Deneb is a fairy who acts as chaperone when the lovers meet. The north pole of Mars points to the midpoint of the line connecting Deneb and the star Alderamin. USS Arided was a United States Navy Crater-class cargo ship named after the star. The SS Deneb was an Italian merchant vessel that bore this name from 1951 until she was scrapped in 1966. The star Deneb, and hypothetical planets orbiting it, have been used many times in literature, film, electronic games, and music. Examples include several episodes of the Star Trek TV series, the Silver Surfer comic book, the Rush albums A Farewell to Kings and Hemispheres, the Descent: FreeSpace – The Great War computer game, Stellaris, science fiction novel Hyperion, and Andy Weir, in his novel The Martian. ^ Merriam-Webster, Inc (1998). Merriam-Webster's Collegiate Dictionary. Merriam-Webster. ISBN 978-0-87779-714-2. ^ a b c d e f g Van Leeuwen, F. (2007). "Validation of the new Hipparcos reduction". Astronomy and Astrophysics. 474 (2): 653–664. arXiv:0708.1752. Bibcode:2007A&A...474..653V. doi:10.1051/0004-6361:20078357. ^ a b Garrison, R. F. (1993). "Anchor Points for the MK System of Spectral Classification". Bulletin of the American Astronomical Society. 25: 1319. Bibcode:1993AAS...183.1710G. Retrieved 2012-02-04. ^ a b c d e f g h i j k Schiller, F.; Przybilla, N. (2008). "Quantitative spectroscopy of Deneb". Astronomy & Astrophysics. 479 (3): 849–858. arXiv:0712.0040. Bibcode:2008A&A...479..849S. doi:10.1051/0004-6361:20078590. ^ a b c Richardson, N. D.; Morrison, N. D.; Kryukova, E. E.; Adelman, S. J. (2011). "A Five-year Spectroscopic and Photometric Campaign on the Prototypical α Cygni Variable and A-type Supergiant Star Deneb". The Astronomical Journal. 141 (1): 17. arXiv:1009.5994. Bibcode:2011AJ....141...17R. doi:10.1088/0004-6256/141/1/17. ^ a b c Chesneau, O.; Dessart, L.; Mourard, D.; Bério, Ph. ; Buil, Ch. ; Bonneau, D.; Borges Fernandes, M.; Clausse, J. M.; Delaa, O.; Marcotto, A.; Meilland, A.; Millour, F.; Nardetto, N.; Perraut, K.; Roussel, A.; Spang, A.; Stee, P.; Tallon-Bosc, I.; McAlister, H.; Ten Brummelaar, T.; Sturmann, J.; Sturmann, L.; Turner, N.; Farrington, C.; Goldfinger, P. J. (2010). "Time, spatial, and spectral resolution of the Hα line-formation region of Deneb and Rigel with the VEGA/CHARA interferometer". Astronomy and Astrophysics. 521: A5. arXiv:1007.2095. Bibcode:2010A&A...521A...5C. doi:10.1051/0004-6361/201014509. ^ a b Allen, R. H. (1963). Star Names: Their Lore and Meaning (Reprint ed.). Dover Publications. p. 195. ISBN 978-0-486-21079-7. ^ James, Andrew (2015-06-17). "The Constellations : Part 3 Culmination Times". Retrieved 2019-04-02. ^ a b Smith, C. E. (1937). "Stars of the Summer Sky". Astronomical Society of the Pacific Leaflets. 3 (102): 23. Bibcode:1937ASPL....3...23S. ^ Pasachoff, J. M. (2000). A Field Guide to Stars and Planets (4th ed.). Houghton Mifflin. ISBN 978-0-395-93431-9. ^ Upgren, A. R. (1998). Night Has a Thousand Eyes: A Naked-Eye Guide to the Sky, Its Science, and Lore. Basic Books. ISBN 978-0-306-45790-6. ^ Kaler, James B. (1998-06-19). "Deneb". University of Illinois. Retrieved 2018-04-25. ^ Perryman, M. A. C.; Lindegren, L.; Kovalevsky, J.; Hoeg, E.; Bastian, U.; Bernacca, P. L.; Crézé, M.; Donati, F.; Grenon, M.; Grewing, M.; Van Leeuwen, F.; Van Der Marel, H.; Mignard, F.; Murray, C. A.; Le Poole, R. S.; Schrijver, H.; Turon, C.; Arenou, F.; Froeschlé, M.; Petersen, C. S. (1997). "The Hipparcos Catalogue". Astronomy and Astrophysics. 323: L49–L52. Bibcode:1997A&A...323L..49P. ^ Perryman, M. (2010). The Making of History's Greatest Star Map (Submitted manuscript). Astronomers' Universe. Springer-Verlag. doi:10.1007/978-3-642-11602-5. ISBN 978-3-642-11601-8. ^ Maíz Apellániz, J.; Alfaro, E. J.; Sota, A. (2008). "Accurate distances to nearby massive stars with the new reduction of the Hipparcos raw data". 0804: 2553. arXiv:0804.2553. Bibcode:2008arXiv0804.2553M. ^ van de Kamp, P. (1953). "The Twenty Brightest Stars". Publications of the Astronomical Society of the Pacific. 65 (382): 30. Bibcode:1953PASP...65...30V. doi:10.1086/126523. ^ Lamers, H. J. G. L. M.; Stalio, R.; Kondo, Y. (1978). "A study of mass loss from the mid-ultraviolet spectrum of α Cygni (A2 Ia), β Orionis (B8 Ia), and η Leonis (A0 Ib)". The Astrophysical Journal. 223: 207. Bibcode:1978ApJ...223..207L. doi:10.1086/156252. ^ Aufdenberg, J. P.; Hauschildt, P. H.; Baron, E.; Nordgren, T. E.; Burnley, A. W.; Howarth, I. D.; Gordon, K. D.; Stansberry, J. A. (2002). "The Spectral Energy Distribution and Mass-Loss Rate of the A-Type Supergiant Deneb". The Astrophysical Journal. 570 (1): 344. arXiv:astro-ph/0201218. Bibcode:2002ApJ...570..344A. doi:10.1086/339740. ^ a b Georgy, Cyril; Saio, Hideyuki; Meynet, Georges (2014). "The puzzle of the CNO abundances of α Cygni variables resolved by the Ledoux criterion". Monthly Notices of the Royal Astronomical Society: Letters. 439 (1): L6–L10. arXiv:1311.4744. Bibcode:2014MNRAS.439L...6G. doi:10.1093/mnrasl/slt165. ^ a b Kholopov, P. N.; Samus', N. N.; Frolov, M. S.; Goranskij, V. P.; Gorynya, N. A.; Kireeva, N. N.; Kukarkina, N. P.; Kurochkin, N. E.; Medvedeva, G. I.; Perova, N. B. (1996). "VizieR Online Data Catalog: General Catalog of Variable Stars, 4th Ed. (GCVS4) (Kholopov+ 1988)". VizieR On-line Data Catalog: II/139B. Originally published in: Moscow: Nauka Publishing House (1985-1988). 2139: 0. Bibcode:1996yCat.2139....0K. ^ a b c Yüce, K.; Adelman, S..J. (2019). "On the variability of the A0 supergiants 9 Per, HR 1035, 13 Mon, Deneb, and HR 8020 as seen in FCAPT Strömgren photometry". New Astronomy. 66: 88–99. Bibcode:2019NewA...66...88Y. doi:10.1016/j.newast.2018.07.002. ^ "GCVS Query forms". www.sai.msu.su. Retrieved 2019-01-07. ^ Lee, O. J. (1910). "Four stars having variable radial velocities". The Astrophysical Journal. 31: 176. Bibcode:1910ApJ....31..176L. doi:10.1086/141741. ISSN 0004-637X. ^ a b Lucy, L. B. (1976). "An analysis of the variable radial velocity of alpha Cygni". Astrophysical Journal. 206: 499. Bibcode:1976ApJ...206..499L. doi:10.1086/154405. ^ Kunitzsch, P. (1986). "The Star Catalogue Commonly Appended to the Alfonsine Tables". Journal for the History of Astronomy. 17 (49): 89–98. Bibcode:1986JHA....17...89K. doi:10.1177/002182868601700202. ^ "香港太空館 - 研究資源 - 亮星中英對照表]" (in Chinese). Hong Kong Space Museum. Archived from the original on 2008-10-25. Retrieved 2019-01-09. ^ Barlow, N. G. (2008). Mars: An introduction to its interior, surface and atmosphere. Cambridge University Press. p. 21. ISBN 978-0-521-85226-5.